You would expect the title of Ironman Asia Pacific Championship and 100 Kona slots to attract a strong field and Ironman Melbourne doesn’t disappoint. Qualifying times in the first 2 years of this event have been seriously fast, even allowing for the shortened swim last year. There are lots of slots, but none of them are easy to obtain. 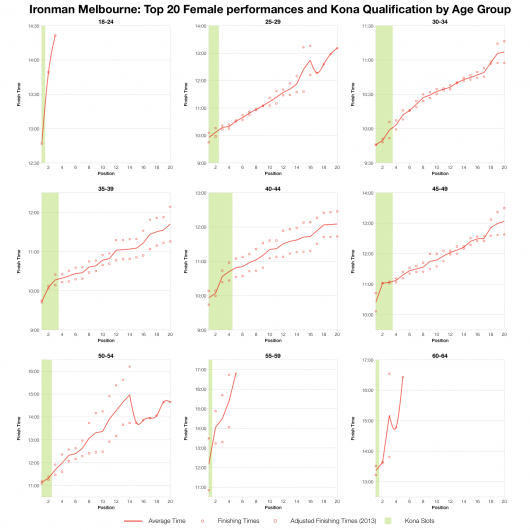 With only a few days to go until the third edition of Ironman Melbourne, here’s a look at results from the last couple of years. Two years of results is a small sample to draw any kind of conclusions, not least when, as the chart above shows, the significantly shortened swim in 2013 had a huge impact on finish times. 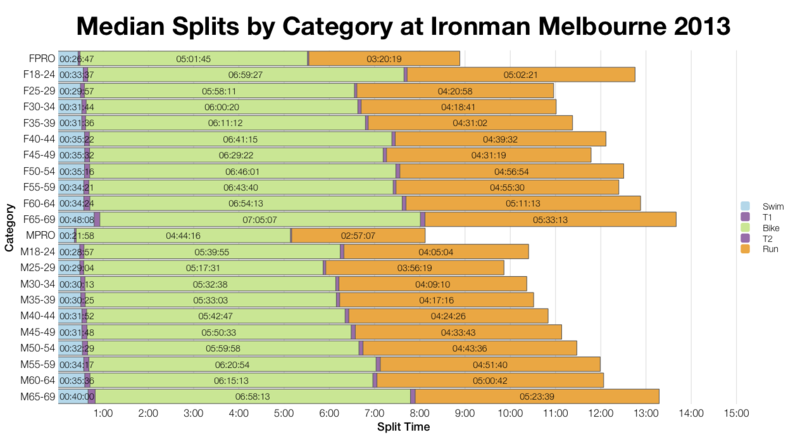 Melbourne was a fast race in 2012, but the reduction of the swim to roughly 1.5km saw the vast majority of competitors finish the swim in times faster than the top finishers of the year before. The bike and run that followed are similar to the previous year, but those savings on the swim naturally contributed to significantly faster overall finish times. I cannot easily aggregate this data to draw conclusions. 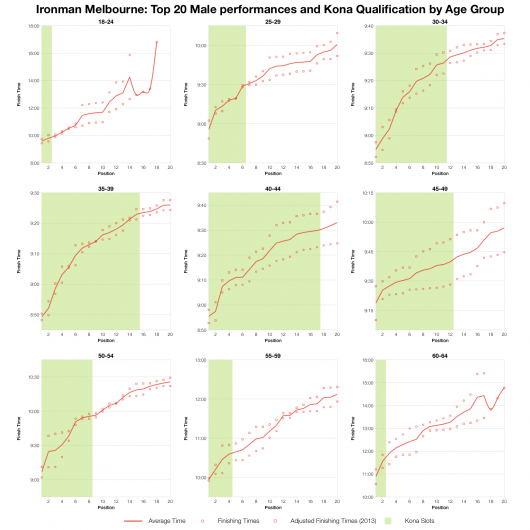 That said I think it’s fairly safe to consider the 2012 results a good indication of what we should expect from the Melbourne competitors on that course. A shortened swim simply exaggerated an already fast competition. Comparing the median splits for the various age groups gives a slightly different view on the two races. 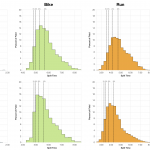 Bike and run in 2013 were, on average, slower than 2012 in many of the age groups. The pattern varies a little, but clearly as well as changes to swim times the race played out differently to the year before. 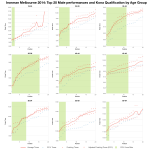 Perhaps 2012 actually represents the faster end of performances we might expect from Melbourne – it’s impossible to tell with only 2 years of results. 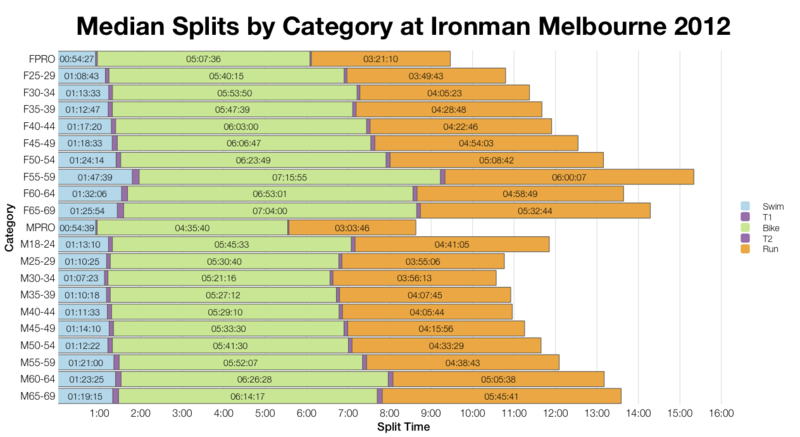 As usual I’ve taken the athlete list from the Ironman Melbourne site and attempted to estimate the allocation of slots (and as usual actual numbers will vary). 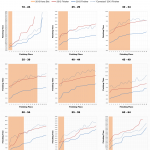 Unsurprisingly the 40-44 year old male age group once again takes the biggest share. 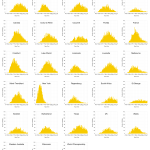 Generally I gloss over minor variations in courses from year to year and hope that they’ll be lost in the averages. Occasionally, when a change is more significant, I drop those results from the overall comparison. 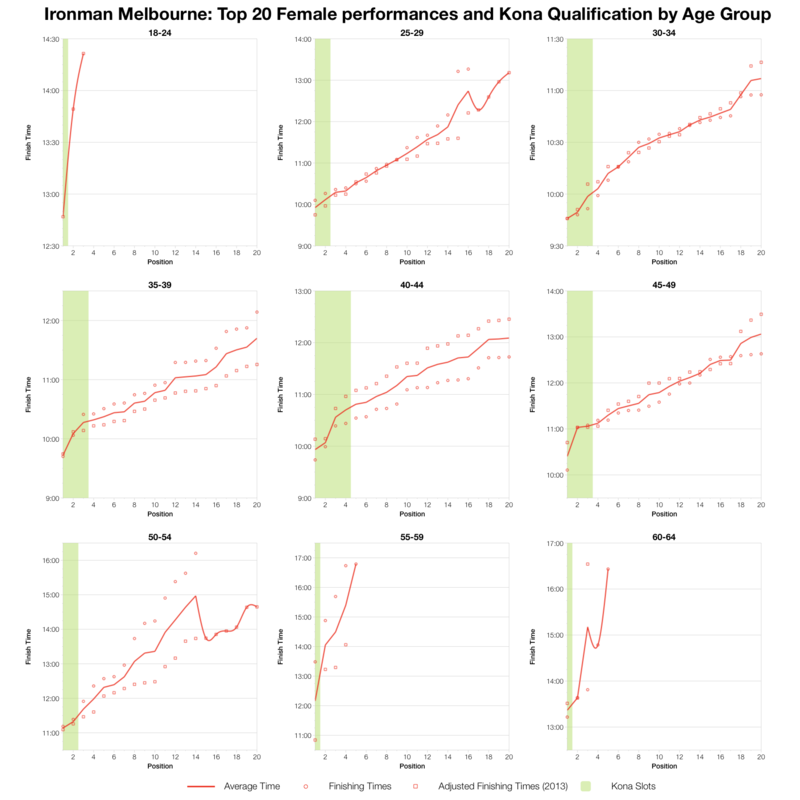 With Ironman Melbourne I decided to try something different and instead adjust the 2013 results for my examination of top age group finishing times. Swim times were scaled from 1.5K to 3.8K assuming athletes held a constant pace and then the overall times were adjusted accordingly. It’s crude and the overall affect is to slow the averages in the charts below. The red circles offer the 2012 top 20 age group finish times for comparison. As stated at the start of this post – Melbourne is a competitive race with fast qualifying times. The charts above prove it. For the major male age groups a 9:30 might give an outside chance of qualification, but a 9:20 would be a much better step towards it. For the women times around the 10 hour mark or just below tend to be the requirement. It’s a safe bet Ironman Melbourne will be a fast and competitive race whatever happens to the swim this weekend.